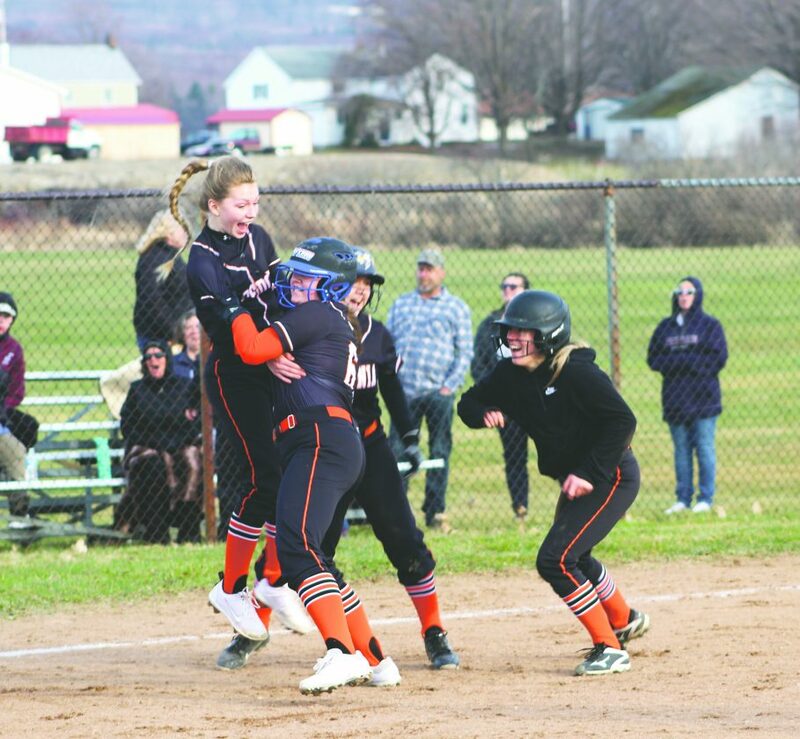 OBSERVER Photo by Braden Carmen The Fredonia Lady ‘Billies celebrate after a walk-off win against Chautauqua Lake, Monday, at Fredonia High School. There is no more exciting way to win a baseball or softball game than in walk-off fashion. This past week, three teams — Dunkirk baseball, Fredonia baseball and Fredonia softball — all won important early season league games on walk-off hits. Here’s a look back at each team’s thrilling victory earlier in the week. Wednesday evening in Dunkirk, the Falconer Golden Falcons jumped ahead of the Dunkirk Marauders, 4-0, in the top of the first inning. After the first half inning, things didn’t look good for the Marauders’ chances to beat their CCAA Division 1 West foe. Dunkirk quickly settled down, however, and got a run back in the bottom of the third inning on an RBI groundout by Alex Ahlstrom. Then later in the inning, Peyton Ahlstrom hit a three-run home run to tie the game at 4-4 after three innings of play. Peyton Ahlstrom continued to throw up zeroes on the scoreboard, not allowing a run outside of the first inning. Through 5 1/3 innings of work, Peyton Ahlstrom tallied 11 strikeouts and kept the Marauders in the game. In the sixth inning, he passed the torch to Jared Glowniak, who kept the Golden Falcons from re-claiming the lead. 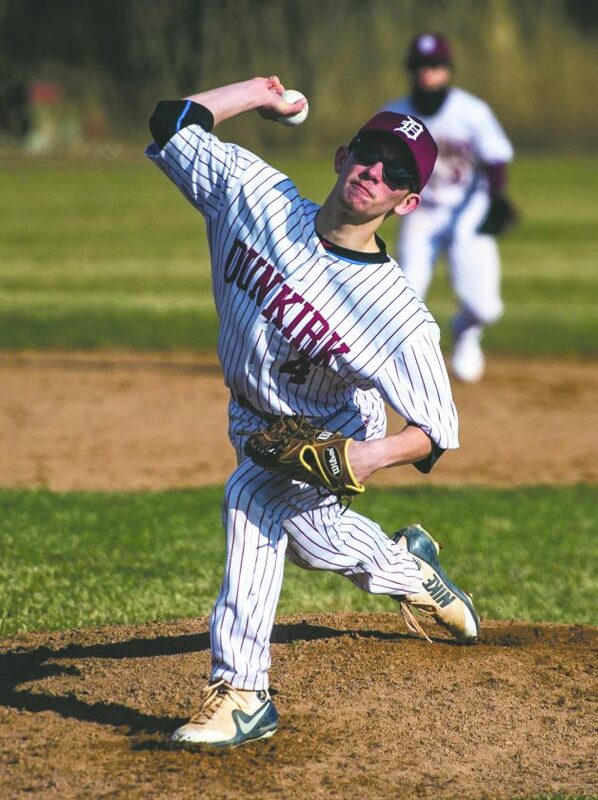 OBSERVER Photo by Ron Szot Dunkirk starting pitcher Peyton Ahlstrom releases a pitch during a CCAA Div. 1 West baseball game against Falconer, Wednesday, in Dunkirk. Heading to the bottom of the seventh inning, the stage was set for the Marauders to walk-off with the victory, and it was Alex Ahlstrom who came through with the highlight reel moment. Alex Ahlstrom hit an RBI double to score Phil Messina to score the fifth and final run of the game for Dunkirk in the victory. The Marauders claimed another league win the next day, on the road at Chautauqua Lake. Dunkirk now carries a 3-1 record (2-1 in league) into Monday’s game against Fredonia, in Dunkirk. 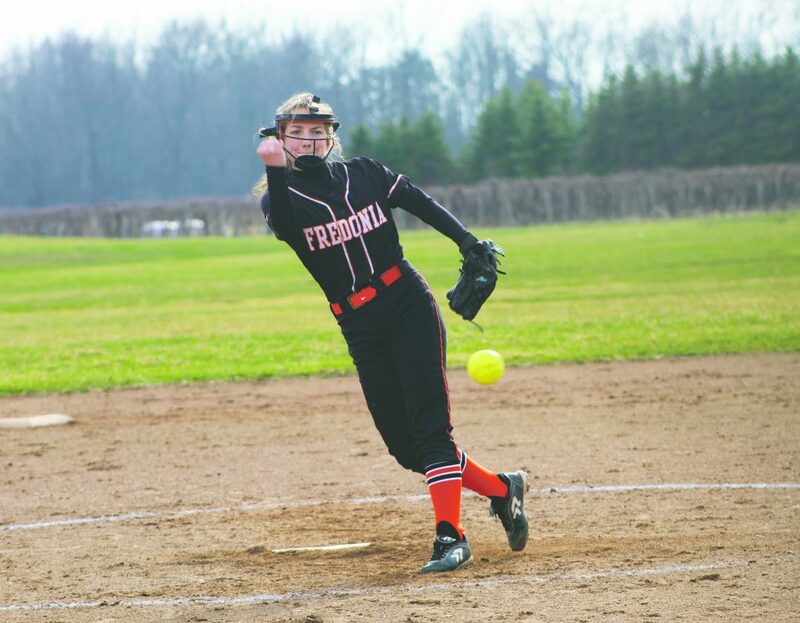 Monday’s league showdown with Chautauqua Lake at Fredonia High School was hyped as a clash of ace pitchers. In the end, it came down to a pinch hitter in the ninth inning to decide the winner. 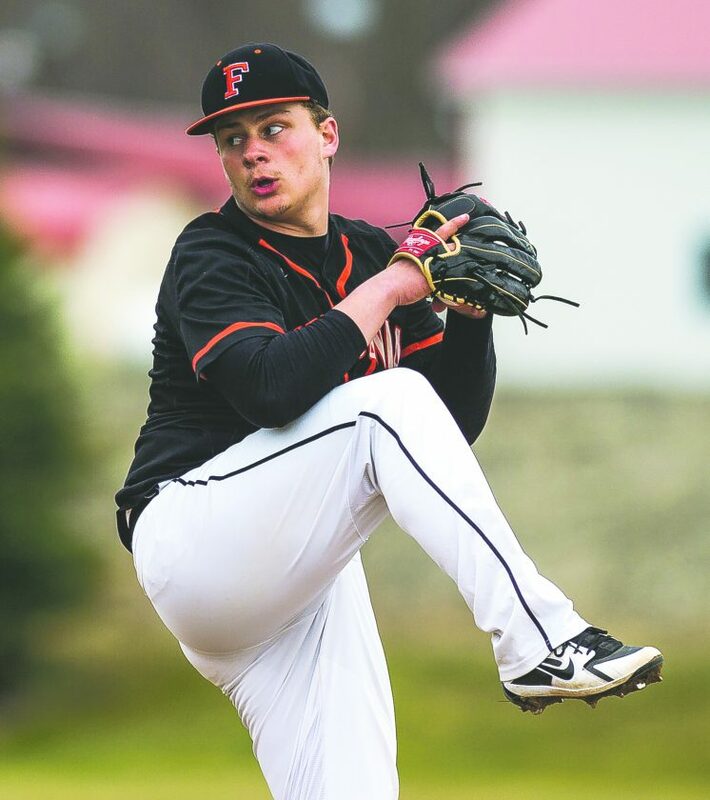 The Fredonia Hillbillies came away with a 3-2 win over Chautauqua Lake, Monday, at Fredonia High School on a pinch hit walk-off single by Jake Davis. OBSERVER Photo by Braden Carmen Fredonia pitcher Maddy Marsh releases a pitch during a CCAA Div. 1 West softball game against Chautauqua Lake, Monday, in Fredonia. 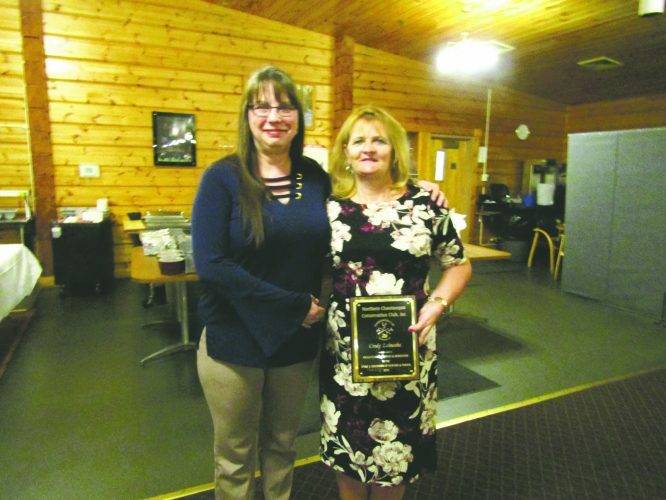 Chautauqua Lake held a 2-1 lead over Fredonia heading into the seventh inning, but the Hillbillies tied the game with two outs in the bottom of the seventh frame. Alec Schrader’s infield single scored the game-tying run for Fredonia, and if not for a diving play by Chautauqua Lake’s Zach Fischer to keep the ball on the infield, the winning run would likely have scored, as well. In extra innings, Fredonia’s Nick Whitfield shut the door on the Thunderbirds. When it was all said and done, Whitfield earned the win with four shutout innings. Finally, in the bottom of the ninth inning, the Hillbillies came away with the win. With two outs and down 0-2 in the count, Davis drove in Dalton Gardner to give the Hillbillies the thrilling victory, eerily similar to a Fredonia win over Chautauqua Lake a year ago. Fredonia followed up Monday’s performance with a 4-2 win at Southwestern, in which Anthony Gullo picked up the win on the mound for the Hillbillies. Now, Fredonia travels to Dunkirk on Monday, looking to improve to 4-0 in CCAA Division 1 West. OBSERVER Photo by Ron Szot Fredonia starting pitcher Trey Swartz delivers a pitch against Chautauqua Lake during Monday’s baseball game at Fredonia High School. While the Hillbillies and Thunderbirds battled off in the distance on the baseball diamond, the softball game of the year was being played at Fredonia High School between the defending State Champion Chautauqua Lake Lady Thunderbirds and the Fredonia Lady ‘Billies. In a rematch of what may have been last year’s game of the year, this time it came down to a player who wasn’t on either team a year ago who made the deciding play. 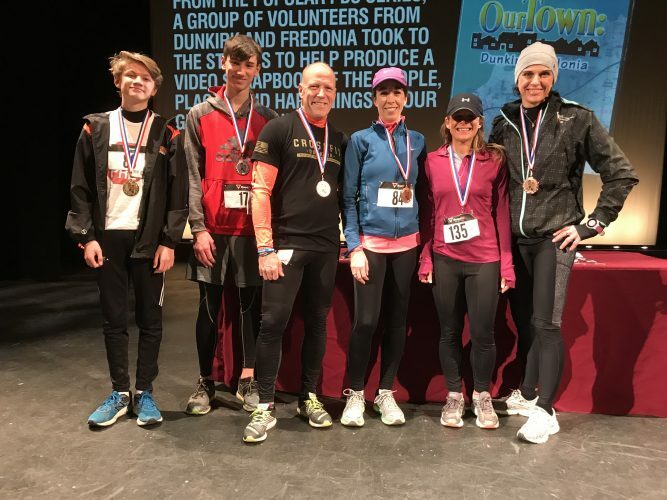 Fredonia’s Laural Erick — one of the most decorated soccer players in FHS history — came on as a pinch runner in the eighth inning and scored the game-winning run on a single to right field and a throwing error. Erick — who has never played softball before this season — slid in to home plate and was called safe, much to the dismay of the Chautauqua Lake dugout and fans. Chautauqua Lake tried to appeal the call, but the umpires would not reverse their decision. The Chautauqua Lake fans and parents were loudly opposed, shouting in anger towards the umpires as they left the field, then directed their frustration at Fredonia coach Jesse Beers. 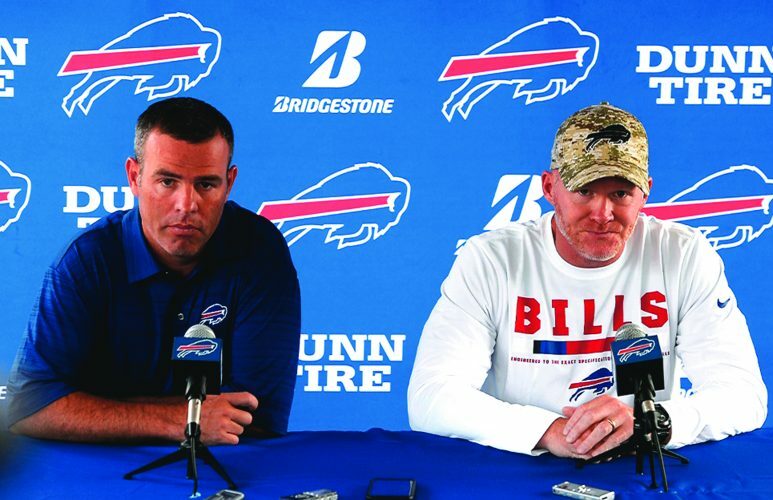 The controversial ending to the game sets up for an incredible rematch once again later in the year, but neither team had time to focus on that throughout the rest of the week. Chautauqua Lake responded with two league wins in the next three days, over Silver Creek and Dunkirk. Fredonia came back, after a day of rest, to throttle Southwestern on the road, 14-1, on Wednesday. Both teams had league games rain out on Friday. Each team is now on break for the next two weeks. Needless to say, this past week was one of the most exciting weeks of the regular season in recent memory — and that’s even counting a Friday full of rainouts. With many teams either beginning their spring break already or having it right around the corner, it may be up to Mother Nature to allow this coming week to even have a chance to live up to the week we just had.